Sylvia Plath Info Blog by Peter K. Steinberg. The blog of A celebration, this is. 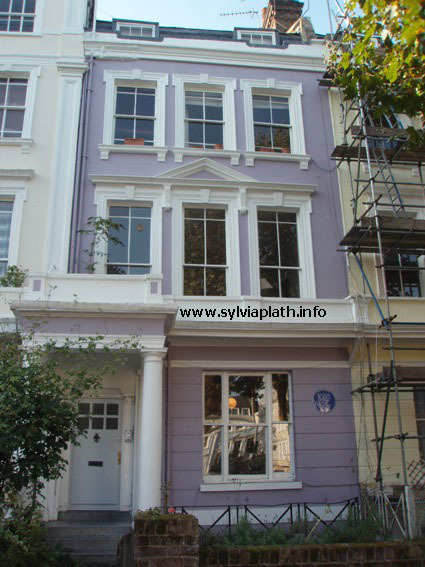 In the past, this blog has featured posts on Sylvia Plath's first suicide attempt: her disappearance, the search and recovery, and the articles that appeared in the newspapers about the event. It was also the subject of a long paper titled "'They Had to Call and Call': The Search for Sylvia Plath" published in 2010, the focus of which was a bibliography of articles found. However, like most bibliographies it was out of date almost immediately. Sadly, too, for obvious reasons it (the bibliography) will never be either 100% accurate or 100% complete. Such is the nature of that discipline. Well, this post continues those as recently I found another source presenting digital access to historic newspapers. "Missing Wellesley Student is Found, Put in Hospital." Niagara Falls Gazette. August 26, 1953: 1. "Smith College Senior Missing." The Times Record (Troy, N.Y.). August 26, 1953: 21. "Girl Found Moaning in Cellar." Buffalo Courier Express. August 27, 1953: 1. "Coed Recovering from Overdose." The Leader-Republican (Gloversville and Johnstown, N.Y.). August 27, 1953: 21. "Missing Co-ed Found Alive Under Porch." Schenectady Gazette. August 27, 1953: 13. "Home All Along." The Morning Herald (Gloversville and Johnstown, N.Y.). August 28, 1953: 1. "Co-ed Recovers from Overdose." Utica Daily Press. August 28, 1953: 1. I first found this site in March 2014; and re-searched the site in May. On the second visit, there were 276 articles where the exact phrase "Sylvia Plath" was found. These articles include book reviews, name-drops, etc. as well as articles from August 1953. "Hunted by Posse, Girl Lies in Coma." Philadelphia Inquirer. August 27, 1953: 6. This lead me to request via Interlibrary Loan the microfilm for this newspaper. A search of this did not find any additional newspaper articles other than the one that appeared on 27 August, but it was worth the effort to confirm. While I was working on this post in June, I found quite by accident another article on Plath's disappearance from August 1953. Somewhat quietly in the summer of 2012, Olwyn Hughes donated to Pembroke College, Cambridge, a collection of items related to Ted Hughes and Sylvia Plath. Several items from this collection were displayed in February 2013. Largely composed of clippings of news paper articles and reviews, among them are some clippings that had to have belonged to Sylvia Plath as several date from before Plath and Hughes met. In Series 2, Life, Subseries 2.3 Sylvia Plath, there were four articles related to Plath's first suicide attempt. In reviewing the articles, I noticed one that was not familiar to me, based on the research I did for my paper "'They Had to Call and Call': The Search for Sylvia Plath". I include the link, but please accept my apologies if it one day does not work... the journal in which it appeared annoyingly keeps changing its url). The three that were familiar to me were: "Top-ranking Student at Smith Missing from Wellesley Home" from the Boston Herald; "Beautiful Smith Girl Missing at Wellesley" from Boston Globe; and "Day-Long Search Fails to Find Smith Student" also from the Boston Globe. The article that was not familiar to me has three headline-ish titles: The first presumably appears above the masthead of the front page next to the word "EXTRA! Wellesley Student Found Alive". If it follows the other articles from that day, the first page featured "Search Ends / Find Girl in Cellar". 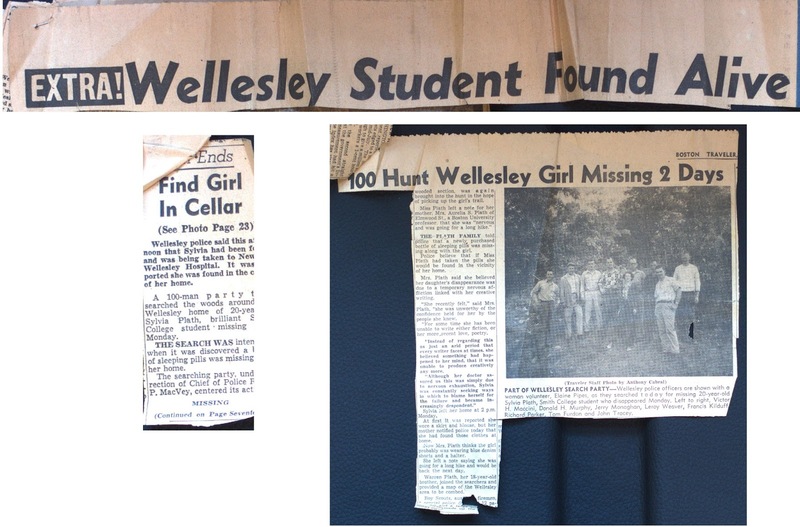 Above the conclusion of the article on page 17, it reads: "100 Hunt Wellesley Girl Missing 2 Days". The article appeared in the lurid Boston Traveler on August 26, 1953: 1, 17. I believe the "Extra!" is the name of the edition of the newspaper. The most brilliant thing about this clipping was the inclusion of a previously unseen (by me) photograph on page 17. The photograph shows a search party in a natural scene somewhere in Wellesley with the caption: "PART OF WELLESLEY SEARCH PARTY—Wellesley police officers are shown with a woman volunteer, Elaine Pipes, as they searched today for missing 20-year-old Sylvia Plath, Smith College student who disappeared Monday. Left to right, Victor H. Maccini, Donald H. Murphy, Jerry Monaghan, Leroy Weaver, Francis Kiduff, Richard Parker, Tom Furdon and John Tracey." The photograph was taken by a famous Boston news photographer, Anthony Cabral, two time winner of the Edwin T. Ramsdell Memorial Trophy. This is truly fascinating. Plath's Esther Greenwood describes three clippings and four photographs in The Bell Jar. The first two are spot on in their descriptions of actual photographs that ran of Plath that summer. 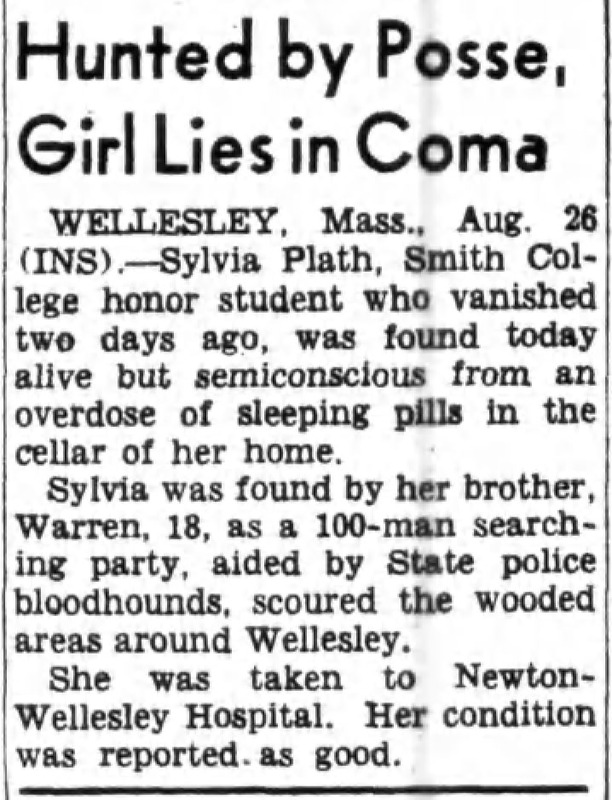 In the article "Beautiful Smith Girl Missing at Wellesley" from Boston Globe, there is a photograph of Plath "showed a big, blown-up picture of a girl with black-shadowed eyes and black lips spread in a grin" (1963, 210). And in "Day-Long Search Fails to Find Smith Student", also from the Boston Globe, the photograph accompanying the article "showed a picture of my mother and brother and me grouped together in our backyard amd smiling" (1963, 210). The third photograph was of "A dark, midnight picture of about a dozen moon-faced people in a wood. I thought the people at the end of the row looked queer and unusually short until I realized they were not people, but dogs"; and the fourth "The last picture showed policemen lifting a long, limp blanket roll with a featureless cabbage head into the back of an ambulance" (1963, 211). This photograph of the search party does not include bloodhounds and is not taken at night as Esther Greenwood describes in the novel, but it gives me some kind of Plathetic hope that perhaps there were at the time. It is evident there were more newspaper articles that ran than we will likely ever fully know, so it is not totally unreasonable to think that the other clippings Esther described actually were printed. The other interesting aspect to these clippings is the fact that they are original, and that Olwyn Hughes had them. How did she acquire them? One possibility is that she obtained them from among Plath's papers that she left behind in England after her death. If this were the case, then it means that Plath had them on hand at the time she wrote The Bell Jar. This brings the total number of articles on Sylvia Plath's first suicide attempt to 192. The large majority of these are AP news stories cut up from their original Boston appearances and sent out over the wire. I still find it fascinating to see how far and wide this story traveled. If you live in a city with access to microfilm from 24-31 August 1953, please consider going to look at it to see if any articles ran. If so, I (we, I dare to speak for this blogs' readers!!!) would love copies/scans of them to further extend the search for Sylvia Plath. My thanks and deepest gratitude to Patricia Aske, Librarian, Pembroke College, University of Cambridge. All links accessed 14 May 2014, 20 June 2014, and 15 August 2014. You can see a bibliography of articles on Plath's first suicide attempt, and read PDF's of them, over at A celebration, this is. In August 1961, Sylvia Plath and Ted Hughes were preparing to move from their tiny 3 Chalcot Square flat in London to the spacious Court Green in North Tawton, Devonshire. When they took the flat in February 1960, they had signed a three-year lease which included the option to sublet should the need arise. The flat was so small that for much of the time one or the other would go elsewhere to write. Ted Hughes first used the flat of W.S. and Dido Merwin nearby at 11 St. George's Terrace; Plath used this space too when she was not writing in their living room. In addition, Hughes also used the small attic flat above theirs rented by "Mrs. Morton" (Mary K. Morton), a character in her own right who became the subject of Plath's September 1960 poem "Leaving Early". On 13 August 1961, Plath wrote to her mother: "We put an ad in the paper for our flat (with a $280 fee for 'fixtures and fittings' to cover the cost of our decorating, lino, shelves, and solicitor's fees, and to deter an avalanche of people---the custom here) and had eight responses and two couples who arrived and decided they wanted it at the same time" (Letters Home 423). As you know, I enjoy a good mystery. Particularly when it involves the use and reuse of archives; searching in boxes and folders not regularly cited, explored, or examined; as well as some good old-fashioned searching through microfilm; hoping that simply casting the line into a pond of blind faith will return a respectable catch. In my mind I liked to call this clue from Plath "The Mystery of the Ad in the Paper". This was one such instance where all these challenges combined and led to a glorious outcome. The advertisement Plath mentions is something I have wanted to find for a long time. I visited the Microtext Department at the Boston Public Library and used their holdings for both The Times and the Manchester Guardian. But, to no avail. I knew that Plath's use of $280 for the fixtures and fittings would not appear in the advert as it was in an English newspaper, and based on other letters she wrote during this period, she generally said that £1 was equal to $2.80. Even I can do this math: $280 = £100. On a visit to Smith College late last year, I had the opportunity to look through the Financial Materials series, which is largely composed of checkbook stubs. These documents are fascinating; there is the chilling stub for the purchase of her gas stove in December 1962; and there are more mundane, everyday use things such as writing a check to self for cash, or paying for clothing and food among other necessities. When I was perusing the August 1961 stubs, I was excited to find that on 18 August, Plath paid by check the sum of £1.17.6 (if I am reading the stub right, there are many computations occurring on this particular stub) to the Evening Standard for the advert. The check number is 198089 and is contained in the book covering the dates 24 June 1961 – 1 September 1961. O.K., so part of the mystery was solved. Armed with this knowledge, I had to set about trying to find a microfilm copy of this newspaper. I knew the British Library has it, but it is roughly 3,269 miles away from me. So… not that easy to get to in a flash. I put in a request through the Boston Public Library for an inter-library loan of the microfilm of newspaper from August 1961. Luckily, a copy was located here in the States, and about two months later -- in early 2014 -- the box of microfilm arrived from the Library of Congress in Washington, D.C. I had prepared to spend my lunch hour going over every single day looking for an advert that included the only few details that I knew: fixtures and fittings, £100, and I also figured something about the location of the flat would be present: either NW1 or Chalcot Square or even Primrose Hill. 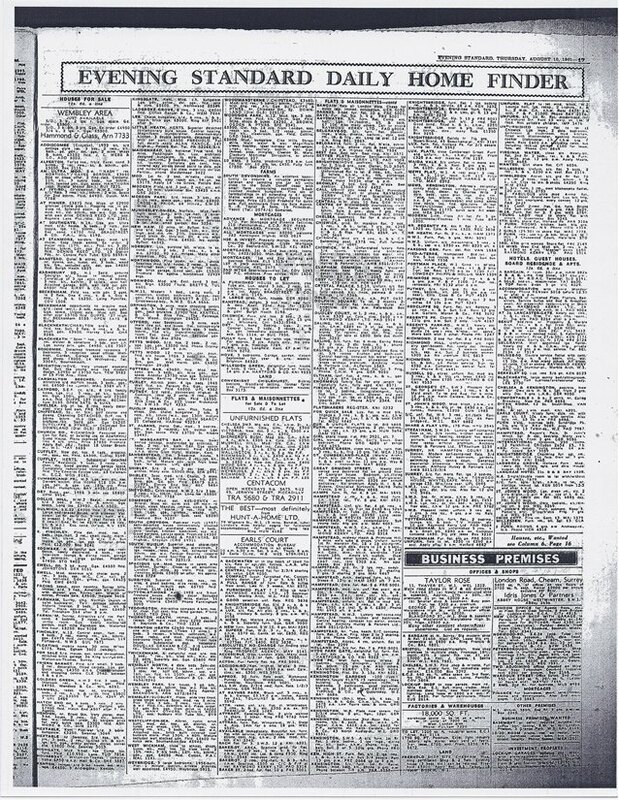 I started at 1 August even though I held little hope it would have appeared that early, mostly to familiarize myself with the layout of the newspaper, the general location therein of the classified ads, the language and abbreviations generally used, and the like. I felt too that this is something Plath and Hughes might have done -- both at this time from house-hunting but also from their earlier massive search for a flat in December 1959 and January 1960 which landed them 3 Chalcot Square in the first place -- as they constructed the language: something akin to what she did in studying the short fiction and poetry published in magazines in order to write something that stood a better chance of being accepted as it fit the right formula and was aimed at the right market. I also knew that the advert would likely not appear after the date of the letter (13 August) as Plath used the past tense "We put an ad in the paper … and had eight responses". So there was really just a short window of time in which I needed to look. Working through each day, I grew a bit anxious. Would I find it? Recognize it? Skip over it by accident in the blur and smudge of questionable quality microfilm or in my own lunch hour restricted haste? Would I then have wasted a month of lunches searching in vain? Would I run out of time before the microfilm was due to return to its home in Washington, D.C.? Nothing on the 1st of August. The 2nd of August turned into the 3rd, 4th, the 5th, the 6th, the 7th, the 8th, the 9th… Nothing! Until the 10th. 10 August 1961*. The one and only day on which the ad ran! The Evening Standard. 10 August 1961. On page 17. In the fifth of six columns, in the top third of the listings, there it is: "PRIMROSE HILL". The first thing that attracted me to the listing was not the bold font PRIMROSE HILL. No, it was something small and more recognizable to me: the telephone number: "PRI 9132". renewable. PRI 9132 after 6 p.m.
Plath and Hughes would have used abbreviation to cut down on cost. And, it is possible my transcription is inaccurate as regards punctuation; neither the film with which I worked nor the printout were the greatest. However, spelled out the ad says the flat consists of two unfurnished rooms with kitchen and bathroom at six guineas per week on a renewable 17 month lease, plus a fee for fixtures and fittings (improvements) at £100. As silly as it might seem, I felt and still feel an immense relief at finding this advert. It puts a piece of the puzzle together. Fills in a gap that I had always felt existed during this period of Plath's biography. * 10 August 1961 was also the 20th anniversary of Plath's first appearance in print when her short poem "Poem" was published in the Boston Herald. Hard to fathom: 20 years! **The Wevill's address is from Sylvia Plath's address book, held by Smith College. Plath and Hughes had dinner at this house, pictured left, a few days after they met the Wevill's, and it was also likely where Hughes went to collect a dining room table the Wevill's gave them to help fill out Court Green. At the present time there is no longer an address of 10 Addison Gardens. There is, however, a 10 Upper Addison Gardens and a 10 Lower Addison Gardens. According to this map of the neighborhood from 1940, it appears that the present-day Lower Addison Gardens formerly did not have the prefix "Lower" and in 1940 there was a clearly marked "Upper Addison Gardens". Furthermore, with thanks to Gail Crowther we can confirm that through at least 1965, there was no "Lower Addison Gardens" according to the official Electoral Registers. So at some point after 1965, while the house numbers appear to be the same, the section of Addison Gardens between Holland Road and Holland Villas Road was renamed to Lower Addison Gardens. All links accessed 5 August 2014. Crowther, Gail and Peter K. Steinberg. "These Ghostly Archives." Plath Profiles 2. Summer 2009: 183-208. Crowther, Gail and Peter K. Steinberg. "These Ghostly Archives, Redux." Plath Profiles 3. Summer 2010: 232-246. Crowther, Gail and Peter K. Steinberg. "These Ghostly Archives 3." Plath Profiles 4. Summer 2011: 119-138. Crowther, Gail and Peter K. Steinberg. "These Ghostly Archives 4: Looking for New England." Plath Profiles 5. Summer 2012: 11-56. Crowther, Gail and Peter K. Steinberg. "These Ghostly Archives 5: Reanimating the Past." Plath Profiles 6. Summer 2013: 27-62. Crowther, Gail and Peter K. Steinberg. These Ghostly Archives: The Unearthing of Sylvia Plath. Oxford: Fonthill, 2017. Doel, Irralie, Lena Friesen and Peter K. Steinberg. "An Unacknowledged Publication by Sylvia Plath." Notes & Queries 56:3. September 2009: 428-430. Plath, Sylvia, and Peter K. Steinberg and Karen V. Kukil (eds.). The Letters of Sylvia Plath, Volume 1, 1940-1956. London: Faber, 2017. Plath, Sylvia, and Peter K. Steinberg and Karen V. Kukil (eds.). The Letters of Sylvia Plath, Volume 2, 1956-1963. London: Faber, 2018. Steinberg, Peter K. "'A Fetish: Somehow': A Sylvia Plath Bookmark." Court Green 13. 2017. Steinberg, Peter K. "'I Should Be Loving This': Sylvia Plath's 'The Perfect Place' and The Bell Jar." Plath Profiles 1. Summer 2008: 253-262. Steinberg, Peter K. "'They Had to Call and Call': The Search for Sylvia Plath." Plath Profiles 3. Summer 2010: 106-132. Steinberg, Peter K. "A Perfectly Beautiful Time: Sylvia Plath at Camp Helen Storrow." Plath Profiles 4. Summer 2011: 149-166. Steinberg, Peter K. "Proof of Plath." Fine Books & Collections 9:2. Spring 2011: 11-12. Steinberg, Peter K. "Sylvia Plath." The Spoken Word: Sylvia Plath. London: British Library, 2010. Steinberg, Peter K. "Textual Variations in The Bell Jar Publications." Plath Profiles 5. Summer 2012. Steinberg, Peter K. "This is a Celebration: A Festschrift for The Unabridged Journals of Sylvia Plath." Plath Profiles 3 Supplement. Fall 2010: 3-14. Steinberg, Peter K. "Writing Life" [Introduction]. Sylvia Plath in Devon: A Year's Turning. Stroud, Eng. : Fonthill Media, 2014. Steinberg, Peter K. Sylvia Plath (Great Writers). Philadelphia: Chelsea House Publishers, 2004. "Banking on his passion for Plath" by Melissa Davis Haller. UMW Today. Spring 2005. "Sylvia Plath's Three Women to be staged in London" by Alison Flood. The Guardian. 3 December 2008. "FBI files on Sylvia Plath's father shed new light on poet" by Dalya Alberge. The Guardian. 17 August 2012. "There Are Almost No Obituaries for Sylvia Plath" by Ashley Fetters. The Atlantic. 11 February 2013.